Life gets busy sometimes and keeping up with all of daily life’s must dos like grocery shopping, cooking, and cleaning can be difficult. 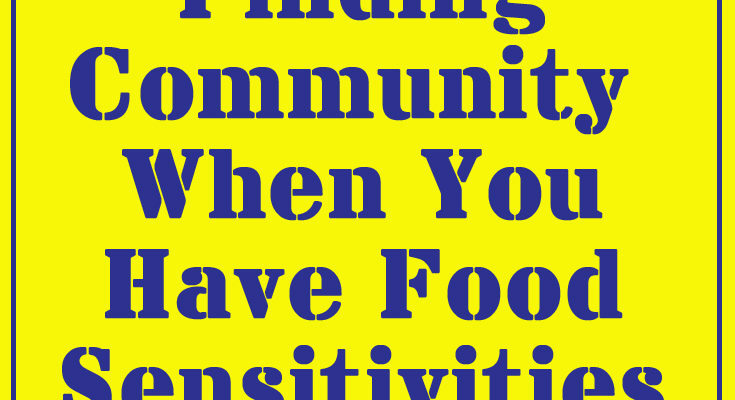 It can be even harder if you are trying to maintain an allergen free diet as you cannot fall back on ordering pizza or buying most frozen dinners. Gluten seems to be in every convenience food out there. So it is up to us to make our own gluten free solutions. Planning your meals ahead can eliminate a lot of that stress. You can consolidate the amount of time you spend shopping, or as suggested here shop online and eliminate a trip to the store. You can prep everything in one round and then do all of the clean up for six preparations at once. You can set something up to be ready to go in the oven or slow cooker saving you tons of time on the day of. This way you have the peace of mind of knowing that your meals were made gluten free. I recently started doing this and it was like leaving myself gifts in the fridge and freezer that I got to eat and also enjoy the freedom from cooking dinner everyday. It is a great feeling to know that you can just get up in the morning and set the slow cooker to come home to a delicious slow cooked meal. I only made six because at least one day a week we tend to go eat with friends or family or go to an allergen friendly restaurant. Sometimes we don’t get to eating all of the meals I preps for a week, but it doesn’t matter much since they are mainly in the freezer and they become my back up meals for when I don’t make it to the store or run out of time to prep one week for day longer than usual. I hope that you find this plan helpful. I always try to incorporate different taste buds and diets. However feel free to add and take away as you wish. This plan is completely gluten free and egg free. I do have some cheese included because some of my family can eat dairy. However if yours cannot stick to all dairy substitutes. These recipes are aimed to please little ones as well, so much of the meal prep will leave the sauce on the side or the vegetables to be cooked or steamed separately. However, if your family does not need this step feel free to mix it all in as you see fit. These are the recipes that you will be making with this plan. Two are for baking in the oven the other four are for the slow cooker/crockpot. I recommend making the oven baked items first and not freezing them since it saves you the step of having to defrost them to cook them in the oven. The slow cooker recipes do not need to be defrosted first. You can simply put them in the slow cooker in the morning and they will be ready by dinner time. Please see below for all of the prep instructions. My kid has grown up eating these recipes and loves them. However, if you are concerned that your child will not like some of the stronger flavors that are in the Chicken Adobo you can substitute that recipe for more Chicken Teriyaki by leaving the bay leaves and vinegar off of the shopping list and making two Chicken Teriyaki instead. The salsa is also a very strong flavor so if you child does not like spicy I recommend leaving some chicken out of the salsa to bake in another pan with just some salt and pepper. This is also noted in the preparation part of this post. At the time of writing this post the cost on Amazon Fresh for purchasing all of the ingredients was around $70 with free delivery for spending over $40. This was with purchasing a few organic ingredients (more details in the shopping section.) However, if you wish to purchase the majority organic ingredients as well as range free meats it would be about $95. As previously stated this cost reflects 6 meals with 4 servings each. So it works out out to be $2.92 per person per meal at $70 or $3.96 per person per meal for majority organic ingredients. The key to making meals in advance is having all of the ingredients beforehand. So I have made a list of everything you will need to make these recipes in advance. Now you can do this by shopping all the ingredients beforehand at your local store or using Amazon Fresh or Prime Now if it is available where you live. In this post I will talk a lot about buy ingredients on Amazon Fresh and having them delivered. I live in Seattle and it is of course the headquarters of Amazon and they have been working on this great program with very affordable online pricing. In fact they are cheaper than many of the nicer grocery stores in Seattle. They don’t have all of my favorite things so I still go to the grocery store often, but for this meal prep plan I just order from them and have it delivered and make it the same day to freeze. Obviously you may already have some of the ingredients in your pantry if so simply do not order those. I am going to assume you already have salt and pepper and cooking oil. If you need more of those things please do add them to the list. These recipes are also aimed to please little ones so much of the meal prep will leave the sauce on the side or the vegetables to be cooked or steamed separately. However if your family does not need this step feel free to mix it all in as you see fit. You will also need some freezer bags or trays. I use the Ziploc freezer bags, but you can use whatever works best for you. If you choose to freeze some of the recipes that are recommended to bake you may want to have some reusable aluminum trays with lids that you can use to freeze it. This is the explanation of how to prep all of these meals on the same day. So hopefully it will make your life a little easier and your meal prep faster. It may take a little longer than suggested the first time, but as you add this into your regular cooking schedule you will see it is quite easy. However make sure you set aside enough time to finish and get everything you need to freeze in the freezer. It takes me less than an hour, but I always recommend 1.5 hours just in case. I start with the chipotle salsa. First chop up half an onion and 2 pieces of garlic and saute them in a pan with cooking oil. Then add the chipotle peppers in adobo sauce and the fire roasted tomatoes. Add about 1/2 a tablespoon of salt. I put the whole can of chipotle peppers in, but it really depends on how much spicy you enjoy. Also, not all peppers are made the same so it can vary. Cook for 15 minutes more. Then let cool just a for a second, just so you don’t burn yourself, and pour half of your mixture into your blender. Add one cup of orange juice and blend until smooth. This will be your marinade for the Chipotle Chicken. Put the other salsa in a container and store it in the fridge for an optional topping for your tacos later in the week. Add the salsa and the chicken, approx. 1 lb, to the bag and seal. Let it sit in the fridge until you ready to cook it in the next day or two. Next, make the rice. I recommend 1 1/4 cup of rice per recipe and there are three recipes that call for Mexican rice. We are going to make these all together. So you will be lightly browning 3 and 3/4 cups of rice. Take a large pan and add cooking oil. Slice up one quarter of an onion and two cloves of garlic and sautee them. When the oil is hot add the rice. Make sure you stir the rice around quickly as the objective is to lightly toast it and not burn it. It will have a slightly bitter taste if it burns. When it all is lightly toasted remove it from the pan and let it cool in a bowl. Two of the recipes call for white rice while the third is for red rice. So, while the rice is cooling open the other can of fire roasted tomatoes and blend it in the blender. Then divide the frozen peas carrots and corn mix into three freezer bags. Add the correct amount of knorr swiss seasoning, which is 1 teaspoon per cup of water, which is 2.5 cups so 2.5 teaspoons. You can use another kind of chicken broth in powder form if you wish, just follow the instructions. Add the tomatoes to one of the bags. After the rice is cooled divide it into the bags, so 1.25 cups in each bag. Seal it and freeze it. Make sure the rice is cool or it could melt the bag. Get out your freezer bags and divide up the meat. Divide the 4 pounds of chicken into 4 equal portions. This leaves about 1/4 of a pound for each serving. Sometimes the chicken thighs I use are different in size and so I end up cutting the larger ones in half. Make one bag for the red meat and one bag for the pork. Label all of the bags for each dish so that you won’t put the wrong ingredients in the bags. Start with the teriyaki and adobo. They have similar ingredients so make sure that you keep the bags straight. The pepper corns can be better if you have a picky eater. That way you get the flavor with no visual evidence. This recipe requires two bags. 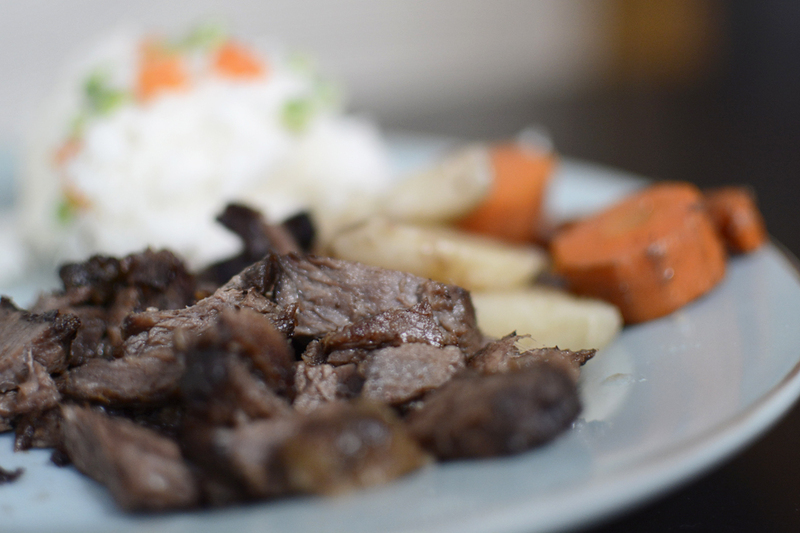 Also, it is a good idea to prep all of the carrots and potatoes for this recipe and the slow cooker beef recipe at the same time. (If you do not have a child and like spicy I would add 2 tablespoons of the salsa you made, but if you are spicy sensitive, put the salsa on top after cooking.) Place the meat in last so that when you dump the bag it will be on the bottom so that it will cook in it’s own juices. This recipe is best if made without freezing first. If you want to freeze it you can and then leave time to defrost it before putting it in the oven. You could make this in the slow cooker as well, but the texture of the chicken will be soft and not firm like chicken teriyaki normally is. 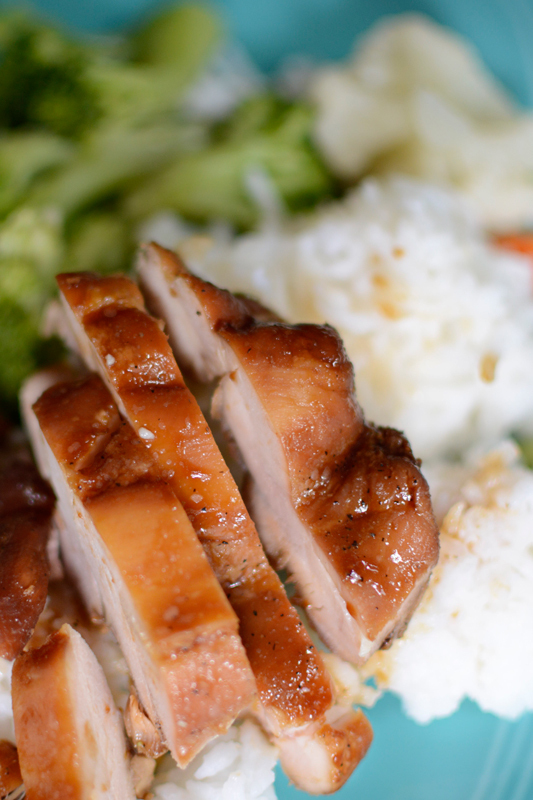 This isn’t like a lot of chicken teriyaki because it is not grilled. However, it is tasty and doesn’t require you standing over the stove or grill to make it. This is a good recipe for popping in the oven when you get home to have dinner ready in an hour. Start white rice in the rice maker, usually takes about 30 minutes. Place the contents of the bag in a baking dish with enough room to fit your chicken, but small enough so that the sauce is still covering some of the chicken. Bake chicken in sauce for 30 minutes, then flip chicken over and bake for another 30 minutes or so, checking to doneness with a thermometer. I usually cook it for about 55 minute total. Start water boiling to steam veggies, or use a veggie steamer, or if you hate steamed veggies stir fry them in a little oil. Rinse the peapods, or other vegetables. Peapods steam very quickly so 5-10 minutes should be enough. They are also good raw. This is another baked recipe. It is again best made without freezing, but can be frozen and then defrosted for baking in the oven. You could also put it in the slow cooker, but the texture will be soft verses firm. Take frozen rice out and put it in the rice cooker with 2.5 cups of water. Takes about 45 minutes to cook. This can depend on your rice cooker as well. Start the water boiling for steaming vegetables about 30 minutes in. Frozen vegetables need 10-15 minutes so plan accordingly. Place chicken in baking pan. Bake for 30 minutes then flip over and bake for another 30 minutes or so. Check the doneness with a thermometer. I usually cook mine for about 55 minutes. Take both of the bags out of the freezer in the morning. Put the contents of the bag containing chicken and other things in the slow cooker with enough water to cover the contents. Leave it cooking on low 6-12 hours. An hour before serving add the zucchini and cilantro. These are simple cheese quesadillas. I make them right before we serve the soup. It is easiest on a griddle or a large plancha, but a pan will work as well. Heat your pan or griddle and place the tortillas on top. Have your pre-shredded cheese ready, either dairy free like daiya or regular or both. When the tortilla starts to rise a little bit flip it over, add cheese to the hot side and fold it over, then let it heat for a bit and flip it one more time before taking it off the heat. Make sure the cheese is melted. The soup is great with some sliced avocados on top. Other toppings are salsa, more fresh chopped onion and/or cilantro. Put the contents of the pork in the slow cooker and cook for 8-12 hours on low. Start the rice cooking about an hour before you plan on serving it. Again, just put in the rice cooker with 2.5 cups of water and hit start. Start the veggies steaming 10-15 minutes before serving. When it is ready remove it from the slow cooker and let it cook for a couple of minutes. If you cook it for over 10 hours it will usually fall apart and shredding the meat will be very easy. Carefully pull the pork apart with two forks or your fingers if it has cooked enough. If you have extra time you can braise it in the oven for a 10 minutes or so on broil. I don’t do this because it takes more time and if you are not careful can dry out the pork. While the pork is cooling you can cut up some limes and avocado. Optional: onion and cilantro. Use a pan, griddle or plancha to heat your tortillas. Then everyone can make their tacos as they wish. This is very useful step to include when you have a toddler who wants to help. Place bag with beef and it’s contents in the slow cooker, cook for 6-12 hours. The longer you cook it the softer it gets so longer is better. Make sure the meat is below the veggies and potatoes so that it can cook in it’s juices keeping it more moist. Start the rice about an hour before you plan on eating. Start boiling your water leaving enough time to steam your veggies for 10-15 minutes. Serve it when ready. I use a slotted spoon with the beef to drain some of the beef fat. Optional: Salsa on the side, butter or margarine on the veggies, tortillas to make it more Mexican. Place the contents of the bag in the slow cooker. Let it cook 6-12 hours.